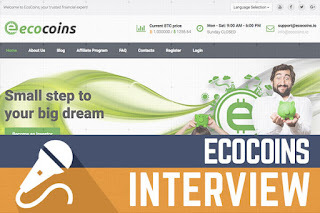 EcoCoins is project that I will review tomorrow, but right before the review administrator decided that he would like to answer to interview questions as well. 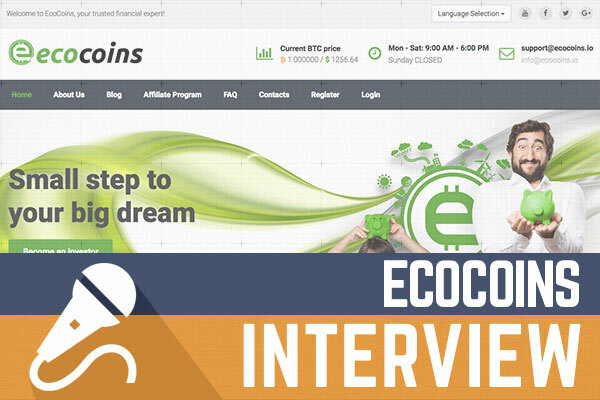 You know lately not that many interviews are published here on DavidNews, so I can't say no to such opportunity and below you will be able to read all the answers from EcoCoins administrator. Of course, don't be blind and remember to think clearly when you read everything that is answered in this interview, enjoy! - Introduce yourself, your team, briefly inform about your experience in HYIP industry. Hello, my name is Kevin Adamson, I’m the CEO of EcoCoins company. The program was planned as a technical startup based on low-cost eco-mining, which we have been working on with a team of my best friends. The investment program has been created later, just at the moment we understood our idea had a good perspective: we needed funds for buying solar panels and mining farms hardware development. Now after almost 6 months of fast development we have more than 52 employees from all over the world, but my feeling is it has started so long ago..:) Nevertheless the company is growing and we’re continuing to actively hire the staff. We are often asked a question concerning our experience in the HYIP industry. I’d not call our program a hyip, we just have rather similar audiences, but our program is not a pyramid that makes new payouts from the old ones, as hyips do. We pay dividends from the profit we get from crypto-trading and eco-mining. - Why did you decide to join DavidNews.com? How did you choose your listing position? We constantly monitor online investment media and blogs. Personally I have been reading your blog with interest and will continue doing this. Your portal has a great reputation, and for me that was a sort of crash test, so I have decided that if you agree to write about our program, it will mean it’s really worthy of attention. The listing has been chosen with an intention to check your investors’ opinion, we have decided that if it would be good, we’ll upgrade the listing to the best one to give your clients more chances to get familiar with our project. - What makes your project investment plans more unique than another project that you can meet out there? Frankly speaking, the uniqueness of our project consists not in the investment plans visual attractiveness. Sure we understand that the investment market competition forces us to make an offer that must quickly arouse a potential client’s interest. But anyway the financial consistency of the plans is much more important. We do business and get profit, and proceeding from its amount we make an investment offer, because the stability of our program depends on this. We prefer Fair play to simple enticement with high percentage that is based on nothing. - Does the project have any hidden fees? Maybe project has some special rules for withdrawal or deposit withdrawal? That would be unfair to our clients. We’re strictly following the rules we’ve made ourselves. Even the 3% fee for urgent withdrawal is clearly described, so a client can see not just the percentage but the amount of commission paid. We always pay the transaction fee for Bitcoin miners for funds withdrawal. - What is your advertising strategy? Do you work with promotion on social media like Facebook to attract investors outside of the regular HYIP investor cycle? Well, this is a captious question =) You know, advertising strategy is a half of success when it comes to business. It’s not enough just to create a good product if you cannot sell it. We have our own secrets and methods. However principally we are focused on new clients engaged by these our partners that have already reached financial success with our program. You will admit that it’s much more fair to entrust the advertising budget to these whom we already have warm relations with, rather than spend it for less effective marketing channels. Sure that we use banner networks as well, but partner relations are much more important for us. And that’s why we plan to upgrade them to the new level and open an MLM direction. We’re now in search of strong leaders to be at the head of this new structure. Perhaps we’ll find somebody among your readers. - How safe is a script that your project use and how safe is the server that your project is using? We use the software we have developed ourselves. We don’t use the ready-to-use solutions, we don’t even use PHP or Perl because the interpreters are pretty unreliable. The security level of our servers (we have more than one) is equal to PCI DSS. And due to the fact that all the server software is binary files, the loads it can sustain is 15000-20000 visits per second. Our website has already undergone several DDoS attacks but our clients haven’t even noticed it. Our clients know that we have developed our own Bitcoin processing and don’t use any third party services, and that excludes the possibility of losing funds. - Why one should choose your project instead of some other? What makes your project stand out? We have combined two fast growing and perspective branches. Cryptocurrency mining on the background of Bitcoin price growth is certainly the winning business model. However there are a huge amount of mining offers today. We don’t just earn money, the principal part of our activity is taking care of the environment. Because the green energy is not just a free resource, it’s a part of nature, which gives us an opportunity to take care not just of our profit, but of nature. So what we made is really unique. By the way, you can learn more about our company from this video - https://www.youtube.com/watch?v=LYjPpTIenRA Our clients don’t just get high stable profit, we work together to create the world which is free of environmental pollution and made-up financial limits, based on cryptocurrency concept. - If investor have decided to invest in your project is there something that one should know before making a deposit? Take a look at our program’s website. You’ll see visual cleanness, simple and intuitive interface. We hope that any person without special knowledge can benefit from our program. But anyway I can give several advices based on our support requests. To get registered on our platform it’s enough to have a gmail address for example, it’s a good quality mail service, so everybody can become a part of our large community. - How you see your project in the future? If you don’t mind, I’ll give one answer to the 2 last questions, because they are closely connected inside my mind. - What is your goal? How much do you want to gain from the HYIP industry? We’ve determined two principal goals, the first is environmental concern and second is green power solutions development. In our blog you can find a number of publications dedicated to solar power. We believe that ecologically clean renewable power sources are the wave of the future. Just have a look at Elon Musk’s unique experience. That’s amazing! He just turned a geek plaything into a utilitarian product. His Tesla is not just a competitive product, it greatly surpasses the cars with usual internal combustion engines. Toyota Motor Corporation has a mass production of cars working on hydrogen, that belche… just WATER into the air! Just pure distilled water! And this is the future, that’s coming, it’s near, and we’re a part of this future. I think you know well that traditional mining (it’s when an ASIC is powered from the wall) is on the verge of efficiency because of electric power costs that take 30% - 90% of profit. Just due to this reason miners refuse to confirm transactions without fees. But we’re completely free of these restrictions. First of all we get profit of mining that costs almost nothing. Sure that while working on new technologies and optimizing our software we just had to merge deeply into the cryptocurrency world. We’ve got unique experience that has given us an impetus for the crypto-trading. The phenomenon of cryptocurrencies including even Bitcoin is very young and that’s why they’re pretty volatile. This makes the cryptocurrency market rather profitable and attractive. Thus having received such a unique experience we’re making ambitious plans. Thanks to our client's’ investments we do not just get profit from cryptocurrency exchanges, but plan and construct new mining farms. Our technological development never stops. Recently our engineers have developed an own prototype of a chip combining the flexibility of FPGA miners and the speed of ASICs. It’s been actively tested at the moment. This will give us a possibility to flexibly change our mining infrastructure and adapt it for various types of cryptocurrencies. Thank you, David, for this interview. Claim FREE satoshis over at Easy Bitcoin Faucet. 11 to 33 satoshis every 10 mins. EARN FREE satoshis from Moon Bitcoin. 514 satoshis per day. Start following our signals NOW & earn up to 270% a day. Ever tried maximizing your free BTC claims by utilizing a BTC FAUCET ROTATOR? Bannerizer makes it easy for you to promote ClickBank products with banners, simply visit Bannerizer, and get the banner codes for your picked ClickBank products or use the Universal ClickBank Banner Rotator to promote all of the available ClickBank products.